This took me by surprise as the first half was a bit boring, but it improved with the arrival of the devil! The play was quite hilarious in parts, the narration of the pub scene was brilliant! I’m not quite sure what the purpose of the play was, but it was a great read! I saw the play in 2012. It was fantastic, a humorous feast for the senses. This play was funny, bawdy but smart, very smart. There was so much to take in that I immediately wanted to see it again. Three months later I considered going to see another performance. This would have required a five hour road trip in weather not unlike what our heroin Prudencia experienced on that fateful night. My prudent side won the debate and I did not go. As I read the verse two years later the images of the play came back to me and laughter burst forth. Reading Prudencia allows you to take the story and the references in. Read this like a glass of wine. (better to say scotch here?) Read slowly and mull the words around in order to appreciate the verse, the witty classic and pop cultural references, and the homage to the classic ballads. The tale is bawdy and not for the faintly saint. I am not sure if I would have enjoyed this if I had not seen the performance. I most certainly would not have approved. (Hee Hee) Performances of The Strange Undoing of Prudencia Hart are rare. I should have made the blizzard trip to see this a second time. If you have an opportunity to see Prudencia, don’t miss it.I will not think of Ossian, Robert Burns or a certain Australian pop singer without remember dear Prudencia’s ordeal and smiling. A fascinating study of folk traditions, from pub sessions, to traditional ballads, to oral storytelling, to...karaoke and YouTube video. Beautiful poetry -- how many plays are still written in verse (for meta reasons, no less)? A very unique scripting style that is remarkably easy to follow, considering the fact that there's no indication of who's actually talking (trust me, it works). I would love to see this play performed in an actual pub, but reading it and imagining it was fascinating enough. How delighted was I to see that the script is out as a book.I loved this play so much. I saw it in 2016 at the GPSCY at Yale in New Haven. It was one of the best theater experiences I've ever had. My favorite part was crumpling bits of paper before the show began to make snowballs that we then threw at the actors. Who were playing all around us by the way, climbing on tables, running through the aisles, and so on.The book was not at all a disappointment. I loved reading it, although I did rely on my memories of the show. I love that the book is basically set as a poem, with no character names beginning the lines, and few stage directions. I am a bit sad that the lines to "Can't Get You Out of My Head" are not written out on the last page, but I managed to find them myself online. I don't know how to explain how clever and fun and powerful this play is whether reading it or seeing it live. You must take the few hours it will take to read this! Incredibly interesting. Would have loved to see the play in person! NTS performed this in my university town and I was so fortunate my editor asked me if I would like to review it because otherwise I never would have known about it, and it's probably one of the best plays I've ever seen. (Review of there here incidentally: http://www.broadwaybaby.com/shows/the...). So of course I had to own it, and I'm happy to say the beauty of the text holds up even without the performance (although, if you have a chance to see it performed, you gotta). 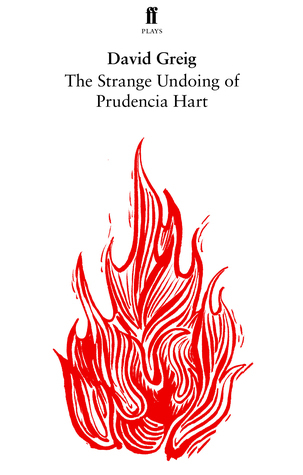 The Strange Undoing of Prudencia Hart is fantastically witty and clever, full of entrancing folkloric reference and pubbish cheer, an absolute must read for anyone who likes Scotland, history, folklore, or drama in general. Also, I recommend reading parts of it out lout if you can, you catch the musicality of it a bit more that way. I loved this in performance. The National Theatre of Scotland toured with it last year. There's a lot that I loved in the play that's missing for me in the script alone; but there's also a lot more depth to be found in the reading experience than I remember. As a reader, I have a much stronger sense of the distinction between poetry and prose and how they're used. Also, I picked up one some puns that I do not remember hearing. The script is definitely worth reading and if you can catch it in production, I highly recommend it. And I'm not simply saying that because I'm a sucker for Tam Lin adaptations. This is a difficult script to judge, since at least 50% of its power comes from the singing of the ballads and environmental staging required... so it's more of a memento for those who have already seen the play than otherwise. That said, it is a fun read, and I hope the acclaimed National Theatre of Scotland production makes it here to the west coast, so I can see it! Difficult to review a play you have never seen performed. Reading this in the way you read a novel is probably not the best way to tackle this work. I enjoyed this play overall but felt I needed to see it on the stage. This is an accurate representation of the play as performed. Firstly, the play is outstanding - go and see it if you get the opportunity. Secondly, the playscript is rather sparse. It leaves out the cast member, which is probably deliberate, but rather annoying. Be warned. Surprisingly capturing, very interesting plot and setting. Great writing, very poetic yet easy to get through. Makes great use of the play form. 1st half awesome! It went a bit off the rails after interval, but very fun. Great production by National Theatre of Scotland at McKittrick Hotel NYC. Really wish I could see this performed!